From the command prompt enter “proxycfg -d” to bypass the proxy. Alternatively, open IE, set proxy server, tick “Bypass proxy server for local addresses” and enter *.%YOURDOMAIN%. Next, from the command prompt enter “proxycfg -u”. This import the proxy settings from IE. This entry was posted in Debugging, System Center Configuration Manger on December 9, 2011 by richardstk. During a period of network issues some of our Windows Server 2008 R2 machines rebooted. Further investigation showed that the servers had experienced a Blue Screen Of Death (BSOD) and rebooted. Most BSOD incidents are caused by faulty drivers. It’s possible to look at the memory dump that’s created when the BSOD occurs and determine which driver caused the crash. This is the method I use. Next create two folders in the root of c:\ called Symbols and Dump. 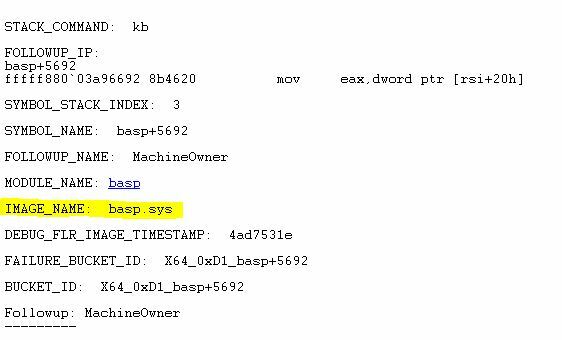 Go to File -> Symbol File Path… Paste SRV*C:\symbols*http://msdl.microsoft.com/download/symbols into the Symbol path box and click OK.
Go to File -> Open Crash Dump and select the MEMORY.DMP file in c:\Dump and click OK. In a few seconds text will start to appear in the debug box. Once the process has finished you’ll see text similar to below. IMAGE_NAME is the driver that caused the BSOD. In my case it’s basp.sys, which is a Broadcom driver. Google the IMAGE_NAME value to find out the driver name, then search for an updated version. This entry was posted in Debugging on November 8, 2010 by richardstk. 01/11/2010 15:15:30 Error Timeout expired. The timeout period elapsed prior to completion of the operation or the server is not responding. Running the SELECT statement took 31 seconds, checking this against the error log showed the application was timing out in 30 seconds. A quick check of the source code in .NET Reflector showed the code was using a SqlDataAdapter Select command. The default timeout for the Select command is 30 seconds. I altered the stored procedure to run in batches, which took less that 30 seconds. Running the application showed this had fixed the problem. Next step, get the application developers to introduce a more permanent fix…. This entry was posted in Debugging on November 2, 2010 by richardstk.